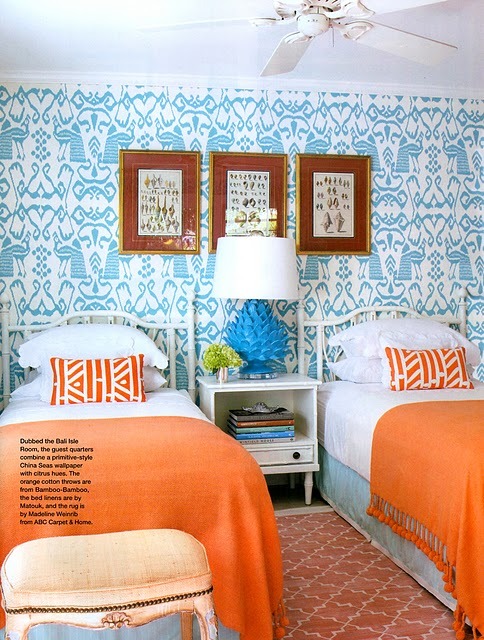 I love everything about this room featured on the Zhush this week from Architectural Digest June 2011. First off as you faithful readers know, turquoise is my favorite color. When paired with orange the mood of the room is instantly happy and makes me think of the summer. Must be the idea of a sunset over a beach. Lets see, what else do I like about the room - the China Seas wallpaper of course! Paired with simple complimentary bedding, it makes the room instantly chic! I really like this color combination and the mixed use of patterns! I was brought up to hate blue and orange together (southern football thing) but I love love this blue and orange combo!